It's not been the best of times lately for self-driving car technology, with one of Uber's autonomous vehicles fatally injuring a pedestrian crossing the road in Arizona, and a Tesla Model X involved in another smash in California in which the driver was killed. Now Tesla has revealed some of the details of the California incident, saying that its Autopilot self-driving technology was activated at the time of the crash. However, the company also says certain warnings were ignored by the driver just before the Model X collided with a concrete barrier. Autopilot can brake, accelerate, and steer, but it's classed as an assistive technology at the moment, rather than a full autonomous mode – which hasn't yet been legalized. The Model X driver ignored instructions to take control of the wheel, it would seem. 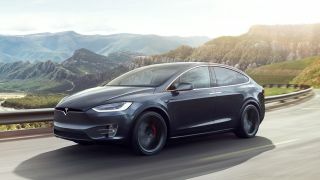 "The driver had received several visual and one audible hands-on warning earlier in the drive and the driver's hands were not detected on the wheel for six seconds prior to the collision," Tesla says in an update. "The driver had about five seconds and 150 meters of unobstructed view of the concrete divider with the crushed crash attenuator, but the vehicle logs show that no action was taken." Apparently the crash barrier had already been hit in a previous incident, and not repaired in the meantime, leading to more damage for the Tesla car. Tesla is once again emphasizing that while Autopilot can't prevent every crash, it should make the roads safer for everyone overall. Drivers must be prepared to take control back from Autopilot at any moment though, the company reiterated.